and subsequent reincarnations of that band. The Honeycombs original line up. From left to right Denis D'Ell, Martin Murray, Honey Lantree, John Lantree, and Alan Ward. Founded by Martin Murray in 1963 and called The Sheratons, they attracted attention for their female drummer Honey Lantree, and they hit number one in several countries in 1964 with the stomping, Have I The Right. They helped launch the careers of Ken Howard and Alan Blaikley, and they crowned Joe Meek's career with his final UK number one single. Touring extensively abroad meant they had more success in Sweden, Japan, and Australia/New Zealand, than at home and sadly despite some excellent songs, including the Ray Davies penned, Something Better Beginning, they never quite repeated the success of their debut. Their fifth single, That's The Way, reached number 12 in the UK charts. As a part of the British Invasion they were recorded performing "Have I The Right" and "Eyes" on the film Pop Gear, along with acts like The Beatles. The film was presented by Jimmy Saville and shown in America in 1965. Elsewhere on the site there is a complete discography for the band, and a list of songs with links to lyrics and info pages. Here is a brief list of some of the Honeycombs best known songs. A list of the original members of the band with very brief notes. - Rhythm guitarist and founder. Previously ran a hairdressing salon. - Drums and vocals. Martin's salon assistant, and the first female rock/pop drummer. - Bass guitar. Honey's brother. - Vocals. Real name Denis Dalziel, he changed it to a phonetic spelling. - Rhythm guitarist replacing Martin Murray. There was some publicity material done featuring the New Honeycombs moniker so it seems the record company weren't even sure then. Read on for information on line ups of the band since 1967 and for more detailed history. In 1963 Martin Murray was a hairdresser and amateur musician in London but he was destined, only a year later, to appear on TV all over the world, and to achieve a number one hit with the single, Have I The Right, along with his band The Honeycombs. He was in an amateur band called The Sheratons which was about to undergo an almost complete line up change. By the end of the year only Martin would remain. 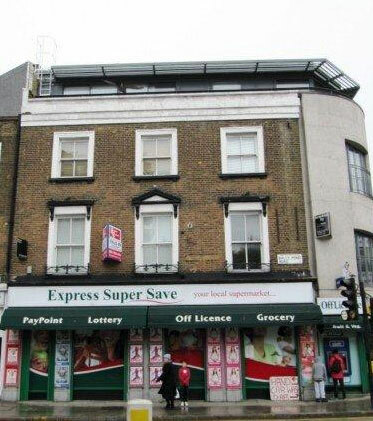 The site of the Mildmay Tavern in Balls Pond Road, where the Sheratons had a weekly residency. As their popularity grew the landlord had to shut the doors by nine o'clock to stop anybody else getting in. At some point in 1963 Sheratons original drummer, Chris, told Martin that he was quitting the band to concentrate on his studies. This left Martin with a problem, as the band had gigs coming up and no drummer. Meanwhile Ann Lantree was having guitar lessons with Martin. She arrived for her lesson and the drummer's kit was still set up in the rehearsal space, as he wasn't able to collect it for a few weeks. It was an important coincidence since Honey then asked if she could have a go on the kit. Martin didn't see what harm it could do, but little did he imagine that she would turn out to be a natural. Having never had a lesson she took to the drums like a duck to water. The rest of her guitar lesson was taken up by her playing the drums and it soon became obvious that she was the answer to Martin's problem. (Although contemporary newspaper reports state that it took months of persuasion for Honey to sign up, in fact, Martin Murray assures me that she jumped at the chance and was thrilled to bits to be involved.) She immediately attracted attention from her first gig at the Mildmay Tavern. In fact the band, which had a residency at the Mildmay, soon became so popular that the doors had to be closed from about nine O'clock to prevent anybody else getting in. Martin Murray, although shrewd in many ways, was naive enough not to realise how much attention would be focused on Honey, and the band spent much time deflecting accusations that she was a "gimmick". Also at around this time Honey's brother John Lantree would follow the band around and sit in, playing bongos at every opportunity. Then Martin bought a new Burns Bison guitar. John fell in love with it and bought a matching bass guitar, and asked Martin to teach him to play. Within a few months he had joined the Sheratons. Shortly afterwards, it appears, the Sheratons' lead guitarist, Roger Crooks, and lead singer, Brian Ford, both left the band to concentrate on settling down with their new girlfriends. The new lead guitarist was Alan Ward* a young classically trained musician originally from Nottingham. The new singer was Denis D'Ell* (real name Denis Dalziel, D'Ell is just a phonetic spelling) The two auditioned together at a church hall in Chingford and were immediately taken on and the line up was complete. * The spellings of Denis/Dennis D'Ell and Alan/Allan Ward appear to have been interchangeable throughout their careers, with both spellings being used in the media, and on record sleeves and even in some autographs so throughout this site both spellings will be used. The band continued playing gigs around London and drew a great deal of attention because of their female drummer. Martin Murray had already had contact with producer Joe Meek, who had already enjoyed success with two number 1 singles, 'Johnny Remember Me' by John Leyton in 1961, and the Tornados 1962 chart topper 'Telstar'. 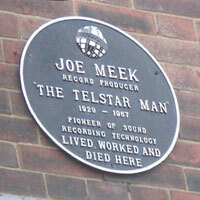 Martin arranged an audition at Joe's home and studio at 304 Holloway Road. It was about two weeks before this audition that they first met Ken Howard and Alan Blaikley. In February 1964 the Sheratons played a gig at the Mildmay Tavern and in the audience were two young hopeful songwriters Ken Howard, and Alan Blaikley. They had heard about this great band with a female drummer and they approached Martin to offer their services as songwriters. Initially Martin turned them down, having already written quite a few songs himself, and also they had enough for the set. But after Ken Howard assured him that they were connected with the BBC and could get the band TV slots he agreed to listen to their music. Among the songs they played him was 'Have I The Right'. The band cut an acetate disc featuring four songs by Howard and Blaikley . Interestingly "Have I The Right" did not feature on the disc. The tracks were "Is This The Best You Can Do? ", "I'll See You Tomorrow", "This Too Shall Pass Away", and I Can't Stop". The audition with Joe Meek went well, with Have I The Right being outstanding among the repertoire. Meek had an unusual recording style and his songs had a signature sound. He would get the band to play the song slower than normal speed and then speed it up on playback which would change the pitch by about a tone or two. However the band still performed the song in its original key when playing live. It is well documented that the stomping sound was achieved by recording in the stairwell using several microphones attached to the banister rails as the band stomped their feet on the stairs. A tambourine was even beaten directly onto a microphone, although it is not all that evident in the final mix. Clearly however Joe Meek was ahead of Jimmy Page who recorded John Bonham in a stairwell at Headley Grange. Perhaps Jimmy Page may have witnessed Joe Meek's recording techniques at some point since he was a prolific session musician in the sixties, but one thing is for certain. He played no part in the recording of Have I The Right. The Sheratons changed their name to The Honeycombs, which was an elaborate play on words. Ann Lantree was of course nicknamed Honey, and since Martin was a hairdresser and one of the most popular styles of the day was the "beehive" the name was suggested (according to Wikipedia by Louis Benjamin) and agreed on. Due to some legal technicality, the Honeycombs found themselves in a very unusual situation for any band. Although their first single was released by a major label, Pye. 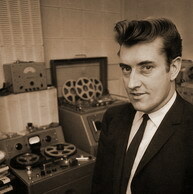 The record company realised that the contract drawn up with Joe Meek was not right. As a result they had to renegotiate with the band and, until a new deal was signed the band could even have signed a deal with another label. Martin Murrray who led the band was a savvy young man and consulted his father's legal advisor. With their debut single soaring up the charts the band held all the cards and the deal they eventually got was probably the highest percentage of any band of the era. Have I the right reached number one at the end of August, right on top of Honey Lantree's 21st birthday. (Also incidentally less than a year after she had first played the drums and John had first begun playing bass) Martin's father had a friend who ran L'Hirondelle, in Swallow street in London's west end. They had booked a private party there to celebrate, but inevitably the press found out and came along, and the party made the national papers. Have I the Right remained at the top spot for three weeks on the Melody Maker chart* (29th August - 18th September. The first nationwide UK chart was 13th Feb 1969) The credibility of the Guinness book of hit singles is seriously questionable See this site for details and was Joe Meek's third and last UK chart topper. The song also spent thirteen weeks on America's Billboard chart peaking at number five on 8th November 1964, and was a major worldwide hit, achieving number ones in Canada, New Zealand, and Australia, number three in Ireland, and number twenty one in Germany as well as the same position for the German language version Hab' Ich Das Recht. 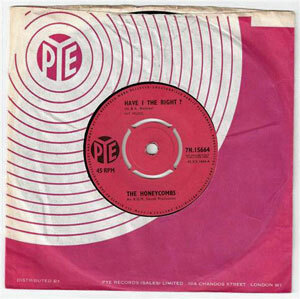 The first album 'The Honeycombs' came out on 25th September 1964 and is still one of the best albums of all time. 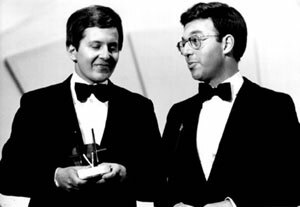 There are no fillers with nine tracks being written by Howard and Blaikley. Martin Muray contributed Leslie Ann, Lieber and Stoller wrote 'I Wanna Be Free', Joe Meek put his name to two tracks, 'Nice While It Lasted', and 'She's Too Way Out', and the Gershwin show tune 'It Ain't Necessarily So' was Honeycombised in fine style. Another of Martin's guitar students was Peter Pye, and during a period when Martin was recovering from a broken leg, Peter was a natural stand in for him. However by the end of 1964 Martin was frustrated with the attitude of his band mates who, perhaps seduced by their success were not making the effort to be professional that Martin wanted. He found he was having to bang on hotel doors to get his band mates to get ready to be at venues and TV studios on time. Eventually this got too much and Martin made an ultimatum. Either the rest of the band take it seriously or he would leave. Unfortunately for him, at this time, Peter Pye was brought forward as an obvious replacement and Martin's bargaining position was severely weakened. There was quite a bit of bad feeling about this but it resulted in the band continuing as The Honeycombs, without their founder member. Shortly after this the band embarked on a worldwide tour starting in Scandinavia and then on to Australasia. Japan and the far east were on the itinerary, and in all these countries The Honeycombs enjoyed considerably more success than in the UK. Many sources state that tours abroad meant that The Honeycombs were unable to promote their follow up singles at home but this is patently nonsense. Their second single, "Is It Because" came out just before their huge Big Beat Scene tour that ran from mid October to late November, and saw them play no less than 35 large venues, to mainly capacity crowds. The fact that their repertoire for these sets consisted largely of songs which they had not recorded may have been unconventional but they certainly had the chance to promote their singles in the UK. Their third single, "Eyes" came out on 20th November and missed out on any live play but then again it was aired on the film Pop Gear but that wasn't released until 1965 so Eyes was swamped (presumably) in a wave of Christmas offerings. By January of course the band really couldn't promote the song at home and as a result is never got further than the top fifty. The single That's The Way was finally released in July 1965. It was recorded when Martin Murray was still running the band, and had been lined up as the second single but that was vetoed by record executives who made them put out Is It Because instead. The song reached number 12 in the charts, but it was too little too late for a band that had been condemned to being a one hit wonder by the popular press even as their follow up single came out in 1964. As far as the UK market was concerned this was the end of the band's success. All Systems - Go! album sleeve. The second album came out 17th December 1965 and although it is still a good album the lack of consistency in the songwriting takes a little away from the overall feel. Only four Howard and Blaikley songs grace its grooves, with the remainder being contributed by Ray Davies, Peter Pye, Don Robertson, Carter/Lewis/Stephens, Boulanger/Kennedy, Pomus/Shuman, Bobby Darin, Hilliard/Garson, and of course Joe Meek. Quite probably the absence of Martin Murray's arranging skills may also have been a factor but for whatever reason the album did not sell as well as the first one. By April 1966, probably due to the constant struggle for that elusive follow up success, the band split up citing disagreements over stage presentation. Only John and Honey Lantree remained and it was proposed that they would now be called The New Honeycombs, however the last two singles released were both credited to The Honeycombs so it appears that the name was never adopted. Colin Boyd wrote the last single, That Loving Feeling released in September 1966. 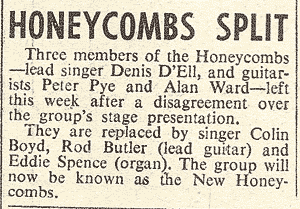 In February 1967 Joe Meek died, and The Honeycombs ended their recording career at the same time. However it turns out that this was not the end of the line at least for the name The Honeycombs. 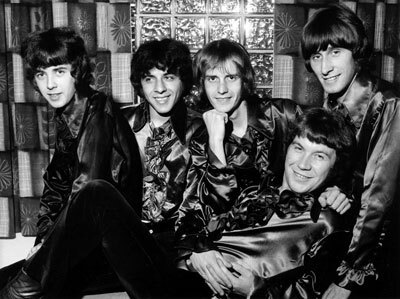 On 8th July 1967 in the year that wikipedia states the Honeycombs broke up, there was a mention in the New Musical Express "popliners" feature stating that The Honeycombs were seeking a new guitarist and vocalist. Applications were invited. It appears that managers Howard and Blaikley were not prepared to accept the demise of their former number one act, despite having great success with the up and coming Dave Dee, Dozy, Beaky, Mick, and Titch. I only discovered this part of The Honeycombs story whilst trying to dig up information about Alan Ward. Numerous websites claim (wrongly as it turns out) that Alan Ward went to Australia, and is doing a Neil Diamond tribute. Many google searches for this turned up nothing except further repetitions of the error. It was not until I came across this website in which the author, Anthony Marshall, claimed that he had been in a band with the drummer from The Honeycombs that I began to unravel this mystery. I wrote to him and asked for more details. He was able to put me in touch with Pete Jermy who had indeed been with this reincarnated Honeycombs line up in 1974. 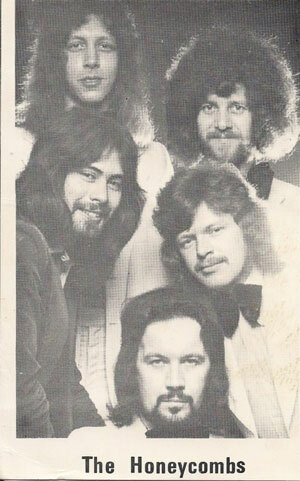 Pete wrote me a very informative email and included pictures of the band in white suits and sporting big seventies hair. Pete could only name some of the band members but he gave me enough details to try some new search terms and at last I came across Neil Diamond tribute - Al James. So Al James joined this new line up of the Honeycombs, apparently organised by Howard and Blaikley. Their first tour seems to have been in 1967 judging by the photo on Al James' website. At the moment I don't know the names of the other members but it seems that this was a completely new band without a single member of any of the previous versions. 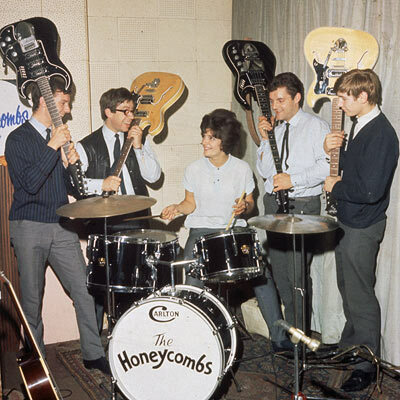 Quite often billed as "The Honeycombes" with an "E" they toured extensively in the UK and across Europe playing venues such as the Top 10 club in Hamburg. Their agents were Barry Collings in Southend. I did write an email to the agency asking if they had any records of the band in their old files, but have not had a reply yet. The Honeycombs line up in 1974. Newspaper picture. 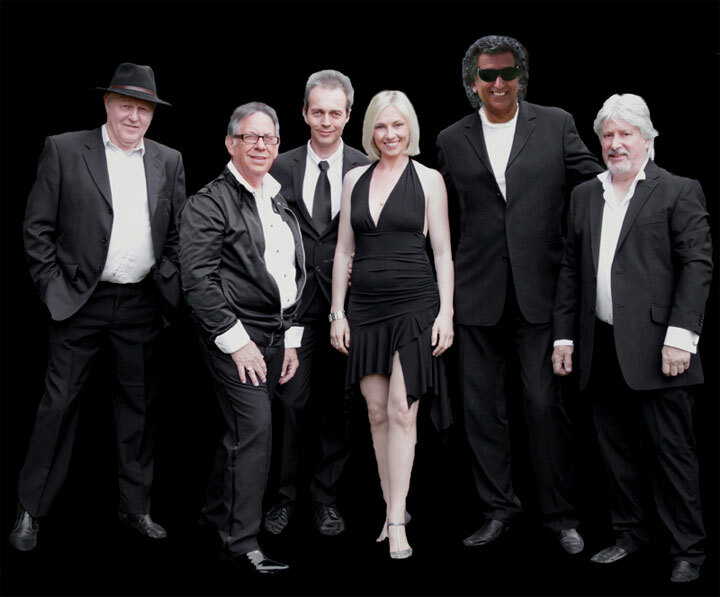 Al James appears to have been the one consistent part of this new version of The Honeycombs, with various members leaving and being replaced when required. The drummer in this line up was Pete Jermy who now lives in Australia. He said "...there was a revival again in those swinging sixties pop bands. I did the circuit of clubs round the UK, that other bands such as Mojos, Searchers, Swinging Blue Jeans, Gerry & Pacemakers, Love Affair, Nashville Teens, Edison Lighthouse, The Applejacks, Cupid's Inspiration etc played at. Of course some had original members in, others a completely 'new' band, as we were, although under licence to Howard & Blakely and our management in Essex." Pete joined during 1974 and recalled the members of that line up as Andy (keyboards), Martin? (guitar), Pete Jermy (drums), Clive (bass), and in the front Martin? * (although we called him Dennis) on lead vocals. *Al James as we later discovered. What is interesting to debate is the degree of legitimacy to afford this version of the band. After all, Howard and Blaikley were the band's managers and since Martin Murray had left long before the band's original founder had been barred from having anything further to do with the name. (almost certainly an illegal contractual requirement but it held at the time) After the death of Joe Meek the only claimants to the name still interested were H&B, and they obviously had their reasons, no doubt commercial, for keeping the name alive. Al James continued as the band's front man for ten years, from 1967 to 1977 and played more gigs than any previous member. However, I feel that there is a need for some original aspect to be present in order to consider this a genuine line up. It strikes me as something similar to a tribute band in todays terms, although without the pretence of dressing up and trying to act like the original band on stage. The Honeycombs line up in 1974. "Licensed" by Ken Howard and Alan Blaikley but having no original members at all. Pete still plays drums in bands in Australia, and toured in early 2011 with Johnny Rawls. In the nineties, Martin Murray was contacted by an Italian entrepreneur who wanted him to reform the band. He promised well paid gigs, top hotels, and star treatment, but only on the condition that Honey Lantree would be in the band. Martin contacted the other band members but all refused to reform The Honeycombs. He then asked them individually if they would object to him reforming the band and each said verbally that they didn't mind. So he set about putting together a band. Then most of the rest of the band were persuaded out of retirement by Future Legend Records to contribute a song to their "Cult Themes from the 70s" album (1999). They recorded a version of the James Bond theme "Live and Let Die" for the album and there were plans to record further although nothing came of this. Denis D'Ell did tour with a version of The Honeycombs with his brother on bass. During this time there was some legitimate dispute over the use of the name and Martin Murray began using the name "Martin Murray's Honeycombs". Other version/s of the band eventually stopped, leaving only Martin Murray still touring. 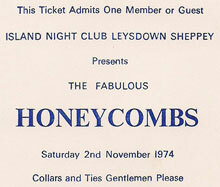 Along with drummer James Green they registered the company name The Honeycombs Ltd.and continued to tour. The Honeycombs line up featuring Martin Murray, Jim Green, Tony Harte, Paul Greene, Colin Fox. This line up then broke up with Tony, Paul, and Colin teeming up with Mac Poole on drums. This line up featured Martin Murray on rhythm guitar, Jim Green on drums, Tony Harte on vocals, Paul Greene on lead guitar and Colin Fox on bass. They toured in Germany in 2007 playing a mix of Honeycombs songs and covers from the era. You tube videos are available but the quality is rather poor. This version lasted a few years but broke up when Tony, Colin, and Paul left and hooked up with Mac Poole, to form a new line up also calling themselves The Honeycombs. 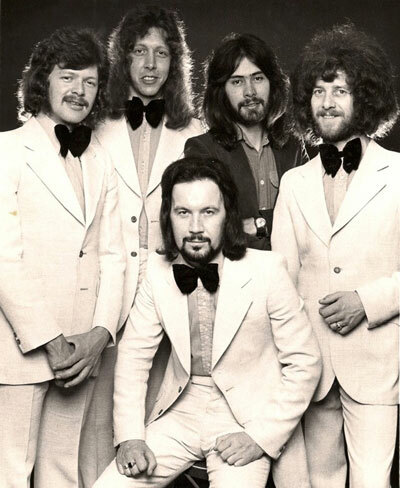 Although Tony Harte's line up lacked any credibility or authority to use the name The Honeycombs, they continued to tour for some time without Martin or Jim Green. Martin then had an argument with Jim Green, and was left once again looking for musicians to reform his version of The Honeycombs. 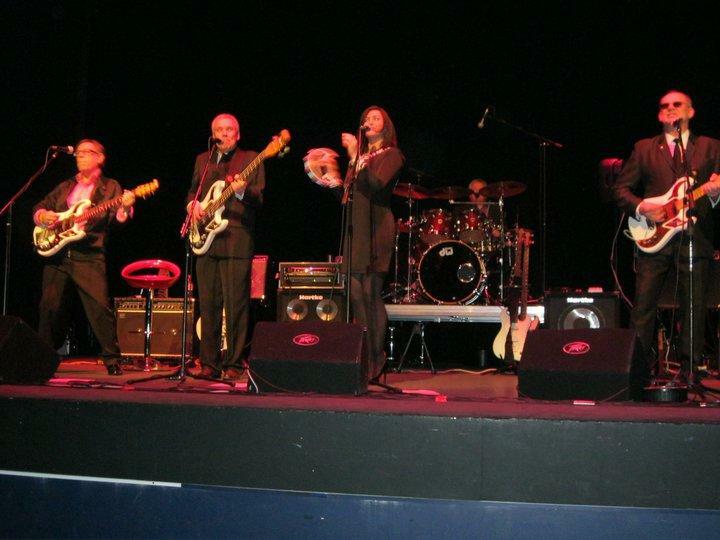 The Honeycombs at The Radlett Centre in 2010. In 2010 Bobby Rio, a mutual friend of Martin Murray and John Butcher, mentioned to John that the original guitarist from "The Honeycombs" was looking for musicians to reform the band. He had suggested to Martin that the 60’s /70’s chart band "Butterscotch" may be interested in becoming the new line up. So a meeting was arranged and Martin went along to see the band perform at the Burnt Mill club in Harlow. He was very impressed and so after a long chat it was decided that Martin would join the band and the name would change to "The Honeycombs". Martin insisted on 100% dedication so the band agreed to play the remaining Butterscotch bookings without rebooking. 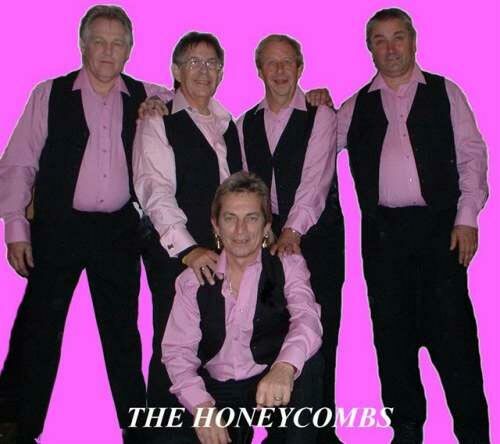 With the name changed and bookings being taken for "The Honeycombs" a new surprise was in store for the band. It came to light that Martin did not have the right to use the name as his ex drummer Jim Green owned the name and the ltd. company and was promising legal action against the band if Martin used any part of the name. So talks began with neither Martin nor Jim coming to an agreement. Meanwhile, Paul Bonner had conceived the "Rock around the 60’s" show and theatres were being booked to start the show tour. The first few shows went without too many problems apart from artists having to drop out due to illness and new artists found to replace them which did cause a bit of confusion to start with. Now, it takes a while for a show to get off the ground and audiences were a bit thin to start with so most of the money made went back into publicity costs which made Martin very unhappy. He seemed to think he was the only one not getting paid and started making demands about the monies being paid to him and the demanding payment before even turning up for a show. This all made things very uncomfortable at venues so the band decided that the only way forward now was to drop Martin. Now at this point the band had been getting good reviews for the shows so decided to continue, but Martin made it quite clear they could not use the name "The Honeycombs" so after consultation the name "The New Honeycombs" was acquired and registered. Although the name had been used unofficially by the Mark III line up of the band it was not reserved or owned by anyone. "The New Honeycombs" continue to tour extensively in theatres across England. 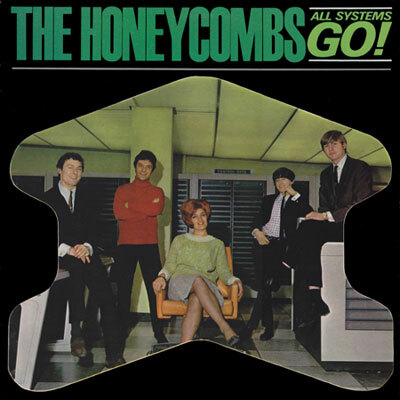 Although they make no claim to be "The Honeycombs", they do perform several Honeycombs songs as well as other sixties songs and their own original material. The Honeycombs 2011 -2012 line up From left to right, James Green, Martin Murray, Olli Tooley (website author) Sacha Florey, Lee Howard, Chris Randall. Martin then made up with Jim Green and started to put together another new line up of Martin Murray's Honeycombs. With Lee Howard on lead guitar, and Chris Randall on bass, they took on Olli Tooley (myself) and Sacha Florey on lead vocals. This line up rehearsed weekly and played one low key live gig and a live radio session as well as recording seven tracks which were planned for a new CD release. However on completion of the recording paid for by me, Martin and Jim forced Sacha to leave the band, and then shortly afterwards sacked me from the band as well. They have since recruited two new vocalists, currently billed as Ricky P and Chrissy C and have plans to play one gig booked at The Landmark Arts Centre in Teddington. on April 21st 2012. The sorry saga goes on, of Martin Murray's attempts to lure innocent musicians to his ailing band. He always insists on 100% commitment from band members, expecting them to quit other bands in favour of his travesty of The Honeycombs. Since 2012 and the replacement of myself and Sacha on vocals, bass player Chris left and was replaced by Anthony Atkins. Not long after that Martin sacked long time friend and colleague Lee Howard. Lee ran the official website and Facebook page, and Martin held on to valuable equipment owned by the guitarist until he passed over full control of the online presence. The replacement was Richard Hudspith, a young guitarist with connections which Martin believes will help the band relaunch their career. Incredibly they have also replaced both the vocalists and the line up now includes AJ Hollywood and Zak Skjerdal on vocals. It may not come as much of a surprise to any readers to learn that the band still have no gig dates lined up and the website has no new information over and above the usual generic claims.